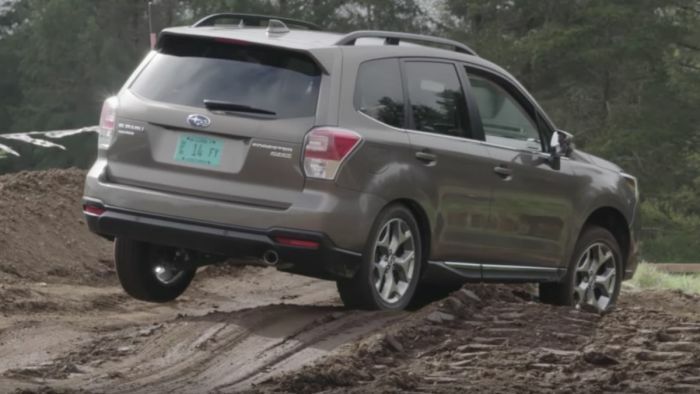 Subaru made changes to Forester's X-MODE for improved off-road capability. See what Subaru did to make the new 2019 Forester even better and why you want it. Adventure enthusiasts don’t necessarily want to go off-road to see how crazy they can get, you want a vehicle that will take you off-road to get you places you normally couldn’t go in a typical SUV. The new 2019 Subaru Forester will get you to those places safely because of one feature called X-MODE that you won’t find on other small SUVs. Forester comes with 8.7-inches off ground clearance and Subaru’s excellent Symmetrical all-wheel-drive system. X-MODE is for more extreme adventures and comes standard on Premium trims. But Subaru enhanced the system for other 2019 models and it’s the one you want. Standard X-MODE comes on the base 2019 Forester and it’s Subaru's solution to improving off-road capability. X-MODE works by altering 5 key areas of the vehicle, starting with the engine and working it's way out to the brakes. Throttle mapping, transmission mapping, center clutch torque distribution, and brakes are all utilized to improve the off-road ability of the vehicle. Subaru made changes to the new 2019 Forester for improved off-road ability. It’s called Dual-Function X-MODE, and it’s available on Sport, Limited, and Touring trims. The new dual-function X-MODE has settings for snow, dirt, and mud and is the latest addition to X-MODE for the fifth-generation Forester. The 2019 Forester with Dual-Function X-MODE adds additional capability when you get into deep snow and mud and steep inclines when you are farther away from civilization. In these scenarios, maintaining momentum is critical, and you don’t want to get stuck, so Subaru alters settings to allow for more wheel slip. Without getting too technical, Subaru alters the engine RPMs to give you more power in slippery situations. The new X-MODE also works in concert with the CVT automatic and keeps the transmission in a lower gear for more wheel torque. Next, it distributes power between the front and rear axels for optimal traction in wet, slippery conditions. The next thing Dual-Function X-MODE does is change the Forester’s brakes by locking up one wheel if it senses it spinning. The system knows it needs extra grip instead of letting the wheel spin. Lastly, the new Forester comes with Hill Descent Control when descending a hill it ensures the Forester’s speed doesn’t increase, managing the braking to provide a controlled, smooth and safe descent. The new for 2019 Dual-Function X-MODE is all controlled by a knob on the console allowing you to switch from Snow and Dirt mode to the new Deep Snow and Deep Mud Mode. This mode allows the Forester to maintain momentum when you get off the beaten path in more extreme deep snow and mud situations. For adventure enthusiasts who want to get farther off the beaten path for hiking, rock climbing, fishing or camping trips, the new 2019 Subaru Forester gets the new Dual-Function X-MODE for improved off-road ability. It’s the feature that will get you back home safely. Good article Denis. Here's my issue - why not offer this in the higher end models across the lines? The market has already done this with many SUVs (optional modes for different situations). I believe Jeep was already ahead on that curve. Case in point, the value proposition of the Touring Ascent is lost because the additional features aren't substantial enough to justify the price point. The Ascent Touring should have the new X-Mode in 2020, along with power folding side mirrors and more adjustable seat options for the front row passenger. Then perhaps at $45K price tag is worthy. Subaru DOES offer X-Mode on nearly all trim levels, depending on the vehicle. The Outback and Ascent have X-Mode on the whole line, base model to touring. The Forester has X-Mode on everything but the base. The Crosstrek is the only model that offers X-mode on the Limited only. When something becomes standard at a certain trim level, it is then standard all the way up the line. The Touring Ascent has all the stuff that has been added as you move up through the trim levels, plus a whole bunch more stuff. Subaru has been offering X-mode since 2014. And with 7 out of 8 Subarus having standard symmetrical all wheel drive, that's one "optional mode for different situations" that Subaru does not have to add on. Never mind the WRX-STI where the entire center differential is driver controlled. You might want to revisit your assessment of the "value proposition" of Subaru vehicles! No manual transmission? No turbo? The CVT is a joke. It grenades and Subaru (at least Subaru Burlington) won’t stand behind it. The only Subaru I still own is my 05 XT and it will be my last Subaru. I love the x-mode on the 2018 Forester XT Turbo. Not only does this have great AWD grip, it's crazy fast in Sport Mode. It's even Faster if you have a Stage 1 tune. I'm glad Subaru is bringing back the XT Turbo on Outback and Legacy, perhaps that'll be my next vehicle. For now, this Forester is more than I expected. I test drove the Mazda 2019 CX5, and Honda's CRV, Ford Escape, Quattro SUV, VW Atlas v6 AWD, BMW X1, X3, Mercedes GLC 300, even Jeep Rubicon, and the Forester in comparison is quicker, more agile, better road grip, and makes the perfect daily driver with great off-road capability. Not a rock climber though, like the Rubicon, but better at everything else. Later I will put a CVT InterCooler and new Intake and Exhaust to retune to stage 2, making it even quicker with more torque. Just enough to not damage the CVT. :) This is the secret to Subaru's popularity,... with a few grand, it becomes untouchable, in it's segment. The Beamer and Mercedes are very nice on the inside, however I'm a practical person, and spending more on senseless extras with a vehicle that doesn't have the reliability of a Subaru, seems like a no brainer.